In most cases, painting over wallpaper is a no-no. But with specially prepared paintable wallpapers, a coat of color can be your best friend. Paintable wall coverings have actually been around for a very long time. 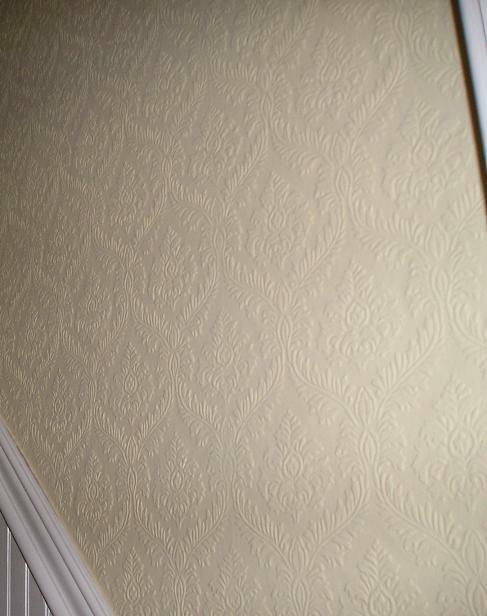 Lincrusta was invented in 1877 and is still the leading producer of this type of textured paintable wallpaper. Made from a combination of wood flour and linseed oil which is molded (not printed) onto a paper backing, it is very heavy and deeply textured. It’s best for hiding serious wall flaws, and is also used extensively in restoration of old buildings. It is extremely durable, perfect for high traffic areas, such as entryways and under chair rails. 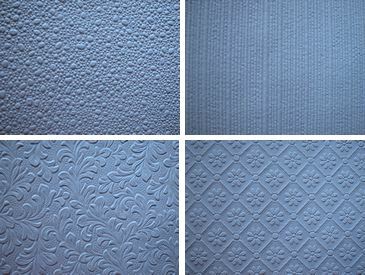 A second type of paintable wallpaper, Anaglypta, is made using a combination of cotton and paper. It’s embossed to create a raised effect. 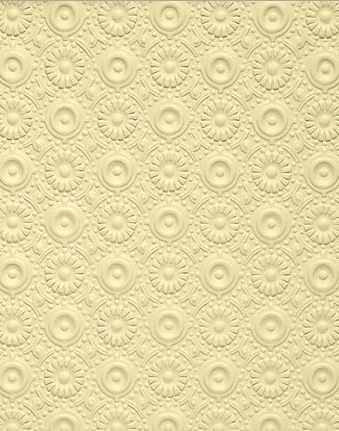 Anaglypta is lighter in weight than Lincrusta, and hundreds of texture options are available. Although Anaglypta is a brand name, it has come to refer to all paintable wall coverings of this type. Anagylpta is installed the same way traditional wallpapers are. The Armadillo line can be dry-hung, but others must be pasted, folded and soaked. One caveat: soak times must be exact to avoid uneven expansion. Prime Anaglypta papers with latex primer before painting. The newest, and easiest to use, of the paintable wall coverings are the glass textiles. Created from fiberglass, these are breathable, fire resistant, and environmentally friendly. In addition, the fibers add a certain amount of stability to damaged walls, holding together small cracks and preventing crumbling. Damaged glass textile can be sanded smooth and repainted. Tassoglass and Textra are two popular brands. Before installing glass textiles, remove any old wallpaper. Sand and prime painted finishes, and scrub paneling, brick, or concrete with Trisodium Phosphate (TSP). Cover right over small imperfections; they won’t show. Fill in deeper grooves on tile or masonry walls with a non-shrinking mud before papering. Glass textiles come both primed and unprimed. Latex, enamel, or epoxy paints can be used, depending on your needs. Latex is more breathable and better in high moisture areas. Enamels and epoxies are highly cleanable and durable. Paintable wall coverings lend themselves especially well to decorative paint effects. Try laying down a base coat, followed by a darker glaze. Wipe off most of the glaze with a soft rag, leaving some in the deep recesses of the patten. Alternatively, after painting the basecoat, use a roller to highlight the raised areas with a lighter color. Faux finishes (like metal or leather) are fun, as are handpainted accents on friezes. Some can even be left as is; the snowy white effect mimics plaster. Paintable papers combine the luxury of wallpaper with the changeability of paint. Once installed, these wall coverings can last up to 30 years and hold a dozen coats of paint without losing texture. Because of the raised pattern, textured paintable wallpapers lend an expensive “custom” look to any house. Paintable papers are cheaper than drywall, making them a good alternative to replacing wood paneled walls, poorly textured drywall, or damaged areas. Because they are so strong, Lincrusta and glass textile can actually prevent further damage to crumbling walls. They also provide an economic alternative to expensive plaster moldings, and look almost indistinguishable from the real thing. Paintable papers are more durable than other types of wallpaper. They are scrubbable and very resistant to tears and scratches. Painted wallpaper is notoriously hard to remove. If you think you’ll tire of the texture quickly, this probably isn’t a good option for you. Paintable wall coverings are expensive when compared to painting and most traditional wallpapers. It’s not the best option for saving money short-term. and then oil based paint. Why you ask, I am remodeling inside a boat. Use the oil base Kilz. Less chance the primer will react badly with the paper or glue. Plus it will work better with your oil base top coat. Must you always prime the Anagylpta wallpaper? If so should you use oil based or latex based and how long do you wait until you then paint . How long should you wait after hanging the wallpaper to start painting the primer on. Not always. Using an oil base primer is recommended as there is a possibility that water-based paint or primer could react with the glue and cause bubbling. I’m using anaglypta as a kitchen backsplash. I can’t seem to find clear answers to these questions: 1) I want to keep the paper white, but need it to be as durable as possible. I bought a water-based poly varnish to seal it. Should I put a coat of white paint on before the varnish? 2) How long do I need to wait after hanging before painting and / or sealing? Painting or sealing can start a couple days after hanging, the glue will be plenty dry. Painting isn’t necessary if sealing with a varnish but test the varnish on a piece of scrap paper. The test will show if there is any color changes that have to be dealt with. If the varnish alone isn’t to your liking then paint first with an appropriate white, retest to make sure this new color combo works. The varnish can be applied over a coat of standard house paint without any problems. If using varnish alone (without paint) then several coats will be needed to fully seal the new paper. I have anaglypta wallpaper and wanted to paint two tone colors. Blue under and gold top coat, I want to use water based paint. 1) should I get a latex base paint with primer? 2) how long should I wait after the base coat dries to apply the top coat? 3) i want to apply acrylic gold paint as the top coat, what is the appropriate technique for that? (How long do I wait to wipe off excess top coat). Thank you for your time! 1) Any good paint will do. Paint & Primer is fine. 2) Wait 24 hours or overnight. If you get back on the paper too soon you might cause bubbling. 3) Could try a tight mini-roller or sponge to get the color just on the tops of the pattern. It will take some experimentation. Use a glaze with a little paint so you don’t have to wipe off, seems easier to me. I am preparing a small kitchen ceiling of 5 sq meters approx. I removed polystyrene tiles first & left a few pock marks when removing the glue. I filled in any damage but painting alone will not cover the damage..so…I am using a fiberglass paper with a light weave pattern. I have used this product successfully on bathrooms & utility rooms and am very pleased with it. my question/problem is that I would like to reduce or mask the weave pattern on the ceiling and was wondering if giving it (its a small area) several coats of paint would work? At reducing the appearance of the weave? I will be using a water based matt paint. Paint alone won’t cover the weave pattern. 2 ideas; Apply a skim coat of drywall mud, sand smooth then paint or apply some kind of texture (like rolled on texture paint). I hung the bead board paintable wallpaper over 10 years ago. Over that time I have painted it once to freshen up the white. Now dust and dirt stick to it and I have to constantly wipe it down just to find more dust on it the next day. What kind of paint is best to use? An enamel type paint would be a good choice. Enalels have a harder surface while many wall paints are flexible and a bit sticky. Cheap paint typically is like this. Two good paints is Benjamin Moore Advance, hard enamel surface, or Benjamin Moore Regal.